The Bureau of Meteorology has confirmed that 2013 was the hottest year in Australia since records began in 1910. Unusual heat was a persistent feature throughout the year. For the continent as a whole, we experienced our hottest day on record on January 7. Then January was the hottest month on record, and the 2012-13 summer was the hottest recorded for the nation. The nation-wide temperature record set for the month of September exceeded the previous record by more than a degree. This was the largest temperature anomaly for any month yet recorded. Averaged across all of Australia, the temperature for 2013 was 1.2C above the 1961-1990 average, and well above the previous record hot year of 2005 of 1.03C above average. What caused these extreme temperatures? Climate scientists have a problem: because climate deals with averages and trends, we can’t attribute specific records to a particular cause. But our research has made significant headway in identifying the causes of climate events, by calculating how much various factors increase the risk of extreme climate events occurring. And we have found sobering results. We previously analysed the role human-caused climate change played in recent extremes across Australia. For various record-breaking 2013 Australian temperatures, we investigated the contributing factors to temperature extremes using a suite of state-of-the-art global climate models. The models simulated well the natural variability of Australian temperatures. Using this approach, we calculated the probability of hot Australian temperatures in model experiments. These incorporated human (changes in greenhouse gases, aerosols and ozone) and natural (solar radiation changes and volcanic) factors. We compared these probabilities to those calculated for a parallel set of experiments that include only natural factors. In this way, natural and human climate influences can be separated. In our previous studies, we then applied an approach (known as Fraction of Attributable Risk) widely used in health and population studies to quantify the contribution of a risk factor to the occurrence of a disease. Health studies, for example, can quantify how much smoking increases the risk of lung cancer. Using the climate models, the Fraction of Attributable Risk (FAR) shows how much the risk of extreme temperatures increases thanks to human influences. In our earlier study of our record hot Australian summer of 2012-13, we found that it was very likely (with 90% confidence) that human influences increased the odds of extreme summers such as 2012-13 by at least five times. In August 2013, Australia broke the record for the hottest 12-month period. The odds of this occurring increased again from the hottest summer. We found that human influence increased the odds of setting this new record by at least 100 times. Recent extreme temperatures are exceeding previous records by increasingly large margins. The chance of reaching these extreme temperatures from natural climate variations alone is becoming increasingly unlikely. When we considered the 12-month record at the end of August, it was nearly impossible for this temperature extreme to occur from natural climate variations alone in these model experiments. We have just completed a preliminary investigation of contributing factors for the record Australian temperature in the 2013 calendar year. In the model experiments, it is impossible to reach such a temperature record due to natural climate variations alone. 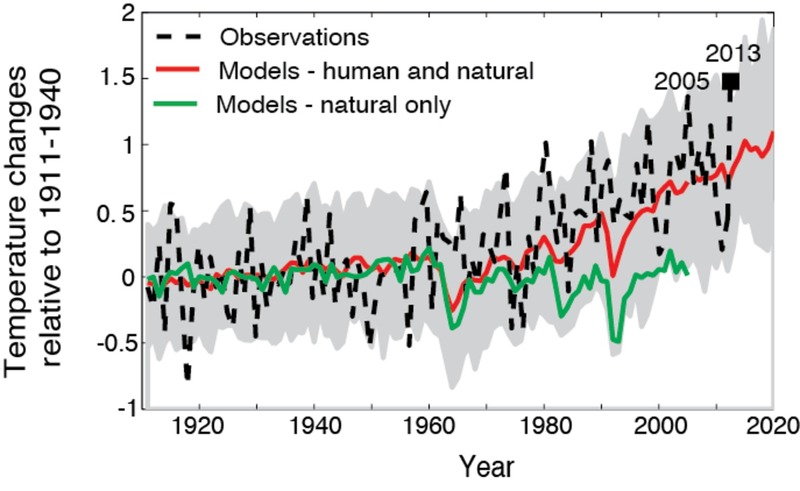 In climate model simulations with only natural factors, none of the nearly 13,000 model years analysed exceed the previous hottest year recorded back in 2005. Clearly both natural climate variability and global warming from humans contribute to recent temperature records. Natural variability always plays a major role in the occurrence of weather and climate extremes. But in the case of our recent hottest year on record, human-caused global warming made a crucial contribution to our extreme temperatures. Our extensive catalogue of 2013 record-breaking events in Australia occurred in a global context of increasing temperatures that must be considered. Globally, 2013 will likely rank as the 6th hottest year recorded. So to return to our question, what caused the 2013 record hot year across Australia? Simply put, our climate has changed due to human activities. Recent extremes, such as this hot year, are occurring well outside the bounds of natural climate variations alone. Interestingly, 2013 records were set in the presence of an ENSO hiatus. 2014 is likely to see development of an El Niño resulting in surface temperatures exceeding those of 2013. South Eastern Australia has already had its first heat-wave of 2014 with sustained temperatures exceeding 40°C for >3 consecutive days causing bushfires which have ravaged over 500,000 ha of South Australia and Victoria. In terms of premature deaths and property loss, it is possible that 2014 will set new records, possibly exacerbated by El Niño induced drought affecting stock and agricultural yields. The immediate future is far from bright. Unfortunately these outcomes are compunded by public policy which is, nominally, predictaed on recognitiion of anthropogenic global warming but in practice seeks to significantly increase the production, export and use of fossil fuels. Before the 2009 [...] Black Saturday bushfires, Melbourne had never recorded a day where the temperature averaged above 35 degrees. That event delivered two of them. This week's heatwave [...] delivered three more such days with average temperatures over 35 - and a record four days with maximums over 41 - in a row. So, from the climate perspective, the 2014 heatwave is more remarkable than that famous 2009 devastation because it was even more extreme. People (except few BOM analysts and climatologists) obviously will not think of it as such because there were no "big fires" (as yet, thankfully Black Saturday-like strong winds have been missing us), so we need to trumpet this news throughout: folks, 2014 is even more extreme than 2009! We've beat that famous extreme record in just 5 years and under ENSO neutral conditions! And now CA seems to be drying up, burning down, and blowing away! I'm no climate change denier. I think the climate is changing and the results will be pretty nasty. However a tad of scepticism is in order. A study mentioned in the following link in which isotopes in the rings which occur in stalactites suggested that Aus is going into a natural dry period. (if the past was the wet period, what must the dry look like??). Presumably less rainfall will lead to generally hotter conditions. Aus may be in for a double whammy. william #5 I see no quantification in the article at your link. Sans quantification it says nothing useful regarding the current ultra-short-term topic of a few decades of big, quantified, warming (maybe bodes even extra badder for Aus over the century). Interesting in its own right of course. Topal #4. Regarding your link, what makes you think satellite or ballon data is the full story on temperature trends? There are questions about the accuracy of both. You are better to average all datasets from atmospheric to surface based. I think if you do that, the IPCC predictions have been reasonable. The principle requirment is to convince the powerful and the masses to adopt measures that will ameliorate and adapt to the irreversible rapid climate change that is under way. That objective will be fostered by emphasising that it is the technological systems that are emitting the greenhouse gases. That is obvious to the technically inclined but not to the masses. "humans caused it" in the title of this article is conveying a false impression that will not help in acceptance of the insight provided. @4 What possible connection between GLOBAL warming(black line) or USA warming (dotted line) in the LOWER troposphere--which is what the models are predicting--and REGIONAL warming in the MIDDLE troposphere in the TROPICS from 20S to 20N are you trying to draw? Be specific. Looking at the labels on a graph is important. Topal @4 seems to think the models run hot. That is, if the models were accurate, both temperature distributions in the final figure above should be shifted to the left. The effect of this, depending on the size of the shift, would be to make Australia's observed 2013 temperature less probable for both natural and natural plus anthropogenic forcings. The effect, however, is not equal. A shift of 0.5 C, for example, would reduce the probability of a year at least that hot from about 30% (1 SD) to about 5% (2 SD) with anthropogenic forcings, but from about 0.25% (3 SD) to about 0.006% (4 SD) for natural forcings only. The reduction factor would be far greater for the natural forcings only than for all forcings. Topal@4, there's a reason why Roy Spencer uses rcp85 for every one of his 73 comparison model simulations. And there's a reason why Spencer compares those rcp85 runs reflecting global average temp anomalies with balloon and satellite observations for only 20S-20N. Spencer was asked if the parameters he used for RCP85 projections were the same as the parameters for observations (mid-troposphere 20S to 20N). Last I looked, he hadn't answered the question. As has been mentioned already, that problematic (error-prone) data is a pretty thin slice of the global budget. Essentially his graph is about the tropospheric 'hotspot'. 2013 is a poor example to choose as the poster child for AGW. In fact, quite the opposite. Taking Sydney as an example, new records for solar radiation were set for May, July, August, September, October and December. The average monthly maximum temperatures track the solar radiation trends. The really hot days seem to correlate closest to low humidity; suggesting that the absence of H2O allows transmission of more solar radiation. All three climate systems, IOD, ENSO and SAM favour dryer conditions across Australia. Eyeballing the BOM average and anomlay maps, the amount of solar exposure for NSW over 2013 was about average. Are you able to furnish data links to corroborate what you're saying? Lower humidity should in general equal cooler minimums in the dark hours. You might want to check 2013 minimum temps to get more insight. If minima were still anomalously high in low humidity periods, then that's going to put a hole in your theory. For what it's worth, the ABC has an article showing the Bureau of Meteorology records for minimum temperature deciles through all of 2013. There is a tiny patch of "Below Average", a few blobs of "Average", and most of the continent is "Above Average" or higher. It appears I set the incorrect field in the "Insert Image" dialogue box to 450 px, resulting in an over-large embedded picture. Mea culpa. I only gave the end of the piece of string. You would have to dig deeper using the names of the researchers in the article to see their full results. Sorry, I was being lazy, not giving a link to the original work. 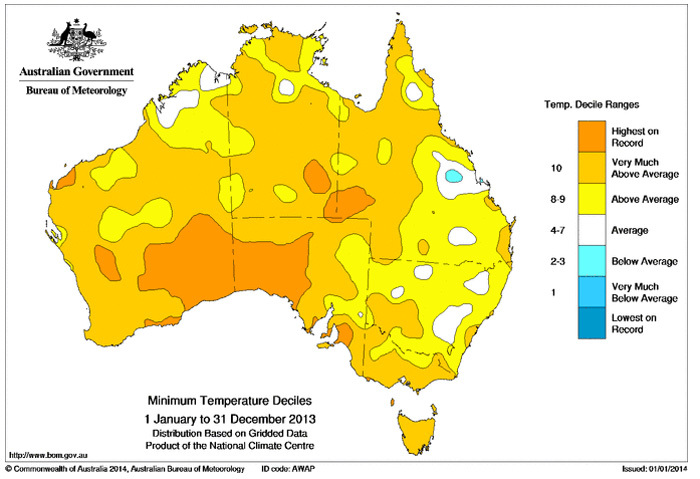 Thanks Composer99, Here are the anomaly maps for 2013, maxima and minima from the Bureau of Meteorology. Bruiser's hypothesis isn't blown yet, but I'd still like to see their source for solar data. [DB] Fixed images. In your BOM graphics, the images in the URL are embedded in the html of the page; you first need to copy the URL of the image from the page and not the URL of the page itself. Then it would have worked. Damn. Which box should I put the width (450) in the insert fields, and do I need to fill in the height box too? Is there a link to explanation on how to use the insert dialogue boxes? I couldn't find it if so. Just discovered the relocated preview button. Sorry. [DB] If you've selected the proper URL for the image, populating the desired width should auto-fill the height. See the moderator response to your previous comment. However, that image, and the two you show have a URL ending with "latest.gif". That indicates the image will be updated early in February to show the Period Feb 1, 2013 to Jan 31, 2014; and again each following month. If you want a permanent record of 2013 you need to either find a gif that shows that, or copy the image and host it at a convenient site; or possibly use the waybackmachine to host the current image. (I haven't done the last so I don't know how to go about it, or whether it is even possible with just images. @Barry - Hi Barry, Your map of NSW solar radiation in 2013 would appear to be within the "normal" range however the map itself is something of an anomaly if compared to almost any weather station across Australia. Take the capitals, Alice Springs and fill in the blank spaces at your leisure. They mostly show 6 months of record exposure. 2-4 months above average and 2-4 slightly below average. On balance they are well above average on an annual basis. Good evening, Bruiser. Please provide a link for the solar data as requested. I'd like to follow it up. Bruiser, it looks like you've just successfully identified the months last year in which Sydney was sunny! We had a wet June and November, but for most of austral winter and spring, local winds have been unusually persistent westerlies, bringing dry air off the continent, low humidity, but warm. Do you have the data to support a continent-scale reason for Australia's hot weather? Especially with minimum temp anomalies very high, I don't see any contradictions. Also ocean temps have been high around Australia IIRC. bruiser, barry has posted temperature anomaly maps, not solar radiation maps. Unless I am missing a picture somehere ... ? ...we calculated the probability of hot Australian temperatures in model experiments. These incorporated human (changes in greenhouse gases, aerosols and ozone) and natural (solar radiation changes and volcanic) factors. We compared these probabilities to those calculated for a parallel set of experiments that include only natural factors. In this way, natural and human climate influences can be separated. If Bruiser has lit upon observations that call that study (and BOM results) into question, then Australia-wide data would be an improvement on unverified claims about two locations. I hope he/she obliges us, because I don't know where he/she is getting the data from. http://www.bom.gov.au/climate/data/ Just select solar exposure from the drop-down, enter a town and follow the bouncing ball. When the data comes up you can select "Plot statistics for this year". Have fun. @Skywatcher - The data is very similar for any town. The particularly hot days coincide with low humidity. No surprise there; it was a very dry year. You can plot humidity against max, min, temp difference,cloud cover and solar exposure. My point remains, solar radiation was at record or above average levels for most of 2013. Particularly hot days had low humidity. Whilst a new national average record was set, no new absolute maximum temperature record was set. That record is 50.7 degrees C at Oodnadatta airport 2 Jan 1960.
barry: Thank you for the clarification. bruiser, I'm struggling to understand what is going on here. Using the BOM information, you claim that (a) Australia's solar exposure was at record or above-average levels in 2013. Are you also claiming that, somehow (b) despite setting a "new national average record", Australia's temperatures this year are somehow unexceptional in light of the all-time high temperature record set at a single weather station? As far as (a) goes, you are contradicted by your own data source, as barry noted above. These maps are constructed from the data you are telling us to review. The maps do not show a significant departure this year from the 1990-2011 average, which stands contrary to your claim "solar radiation was at record or above average levels for most of 2013". As far as (b) goes, well, if you are going to suggest that a single weather station record set in 1960 outweighs a continent-wide record, I don't believe there is anything to say other than that such a claim is nonsensical. Perhaps you can clarify? @Composer99 - Sorry, did I not already say that the maps you reference appear to be anomalous when compared to the recorded data from across the country. Go to the BOM Climate and past Weather Data and plot solar exposure for 2013 for any town or AWS. Let me know if you find one that does not meet the criteria that I outlined above. Bruiser, thanks for the link. I can confirm that all the capitals and about 20 other stations I checked all had record-breaking solar exposure. I think it's safe to assume I didn't just chance upon the outliers. So I checked the colour maps against the values and they are a good fit. The problem, I realize, is that the resolution of the colour maps is too coarse. The difference between average and record-breakers is 1-2 Mj/sq/m, but the colour maps are in increments of 2 Mj/sq/m (annual), and 3 Mj/sq/m (long-term average). So I withdraw the earlier comparison. I could find no national average data, so can't crunch the numbers. I checked the warmest years for each state. 3 broke records in 2013, 4 were warmest in previous years. Of the 4 states that were warmer prior to 2013, solar exposure ranked 3rd for two of them, 8th for another, and 13th for NSW. This is based on the solar exposure data for one location in each capital. The SE data is only 24 years long, 1990 to present. Heavy caveats are applied. My extrapolation was spatially similar to yours (1 data point per state for me, 9 data points for the nation for you). With less than 50% correlation between highest solar exposure and warmest years for state based on limited data, solar exposure does not seem to be a dominant influence. I checked the diurnal record for the full period (from 1910). The trend is downwards. Nghts have warmed faster than days, indicating solar influence is not the dominant driver of rising temps, although this says little about the record 2013. The diurnal trend is more consistent with GHG forcing. Of the last 4 warmest years nationally, 2005 and 2013 were close in highest solar exposure and ENSO neutral. The next two warmest years (1998 3rd, 2002 4th) were El Nino years with average solar exposure (as best I could tell). We do not have solar exposure records prior to 1990. That's the best I could do with the data and time available. If I had national solar exposure data, I could make a better comparison with the global temperature record to check for correlation. From limited data (I checked temp record with solar exposure from a small number of stations - the capitals) the correlation does not seem to be strong. For example, while Darwin Airport had it's 3rd highest solar exposure of the 24-year record in 2006, that year saw the 18th highest temperature in the same period, same location. I may do more work when I have time - like plotting and comparing time series of both indices for various locations. But check it out more thoroughly for yourself if you feel inclined. Hi Barry, My check of values against the map found only one where the actual record was within the correct colour band; some were over 2MJ above the displayed range. 2Mj/sq M/day is an enormous amount of additional energy if you accept the calculation that just 0.4 W/sq M is sufficient to cause the decline in arctic ice. (energy required to melt 290 cubic Km of ice). Diurnal variation has interested me for a few years. For example, if you plot the data for Melbourne, you get a steady decline. However, the Melbourne weather station is situated at a busy city intersection. I plotted the data for Laverton on the same graph and there is a great correlation until about 1964 when there is a steady roll-off in the Melbourne values. No such decline occurrs for Laverton - suggesting that the Melbourne site was affected by some form of development. Bruiser, I rechecked the 2013 solar exposue map against annual values for various locations again and you are quite right. The colour bands do not match the local values. I will email BOM about it. 2Mj/sq M/day is an enormous amount of additional energy if you accept the calculation that just 0.4 W/sq M is sufficient to cause the decline in arctic ice. (energy required to melt 290 cubic Km of ice). How then would you explain that 4 out of 7 states had warmest years when before 2013, when solar exposure was not highest (in the capitals)? Following are the warmest years by state, and solar exposure data value (Mj/sq M/day) for that year, ranked from highest, per single locational in the capitals, then record solar exposure (2013) in bold. Period is 1990 - 2013 incl. which is all the solar exposure data we have. * 2005 is missing December solar exposure data for all locations, but it is very high the other 11 months. If solar exposure is the dominant influence, and you are happy to extrapolate by single locations at the capitals, then why do these results not correlate? Why is annual solar exposure 2 Mj/sq M lower than the record for Sydney and Canberra during NSW/ACT warmest year? Why did Hobart's annual solar exposure rank 11th during Tasmania's warmest year? @Barry - Hi Barry, I have not looked too closely at other years. My original point was and remains that the average temperatures across Australia should have been a new record based on levels of solar radiation alone. The major climate influences, IOD, ENSO and SAM all favour a drier South-eastern Australia. There are way too many variables in our climate to settle on a single cause for any particular year. Blaming the Australian 2013 record temperatures on AGW flies in the face of a very obvious and dominant natural cause. the solar exposure data is only 24 years long. It's possible that there have been previous years with more solar exposure (but lower national average temperature). So in order to test your hypothesis I did a state by state comparison. Using your methods (spatially similar), most states experienced the warmest years when solar exposure was not at the highest, and some states were warmest in a year when solar exposure was about average. I agree that solar exposure should have some influence and that other factors are at play. But I think positing that solar exposure is the 'dominant' factor based on such a cursory analysis isn't convincing, particularly when belied by a slightly more granular look. We must admit that what we have attempted is a tiny fraction of the work done for formal studies, like the one mentioned in the article above, so neither of us should be jumping to conclusions. There are way too many variables in our climate to settle on a single cause for any particular year. Strongly agreed. The same point is made in the article above. But our research has made significant headway in identifying the causes of climate events, by calculating how much various factors increase the risk of extreme climate events occurring. We found that human influence increased the odds of setting this new record by at least 100 times. Your approach is different. You are looking at attribution. Strange then, that you, me and the authors all agree that that is not possible for a specific year. The idea is that there are many short term factors that influence annual temperatures. As a result temperatures may be warmer, or colder from year to year - but always within a limited range. Long term factors, such as increased atmospheric forcing from CO2, however, can shift the mean of that range, allowing temperatures that we would never have seen otherwise. That is clearly seen in the figure above. 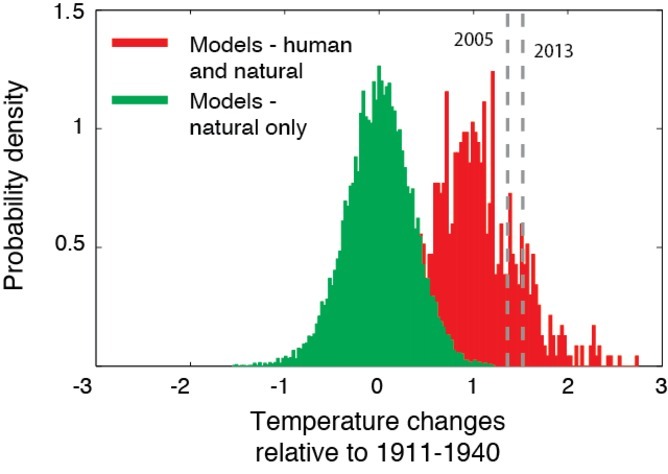 2013 is a warm year for the "human plus natural" distribution, but an extreme year for the "natural only" distribution. That distribution pattern is born out by comparing the distributions for Australia's annual temperatures for 1910-1939 (our "natural" sample), and those for 1990-2013. The former has a mean of -0.339 C, and a standard deviation of 0.323 C. Relative to that period, 2013's temperature was 4.76 standard deviations above the mean. Assuming a normal distribution (which is close enough for a rough estimate), that indicates the 2013 temperature had a return interval of less than once in every 300,000 years. A full statistical analysis of all available data may well reduce that return period, but it will not stop it from being an extraordinary event ... assuming natural forcings only. In contrast, relative to the 1990-2013 mean, 2013 is only 2.3 standard deviations above the mean. That yields a return interval of more than 1 in a hundred. It is a little unusual that we should have so warm an event in just 24 years on that account, but not particularly so. Note that the logic of the case for attribution assumes that 2013 is unusually warm, even for recent years. If it were not, it would only be a couple of standard deviations above the early twentieth century mean. In that case we could have little confidence that there had been a shift in that mean, and hence a cause of that shift. This means that we expect the unusual warmth of 2013 to not have been caused just by global warming, but by other factors as well. So, you have provided evidence that 2013 is unusual, even for recent years. But that is a necessary condition for the argument for attribution. If no such unusual factor existed, the theory of global warming would be embarassed by underpredicting the actual temperature. So, while it is interesting that you have found that factor, it is not particularly germaine unless you show it to be a more significant factor in 2013's unusual heat than anthropogenic forcing. To try and resolve that question, I determined the difference between the mean solar exposure over the period 1990-2013, and the 2013 solar exposure for all towns shown in the map of average solar exposure @28 above. Out of interest, that is a total of 61 towns, out of which just 2 (Burnie and Cairns) did not set a record. Overall, the mean 2013 solar exposure anomaly for those 61 towns was 1.88 MJ/annum per meter squared. Averaged over the whole year, that is just 0.06 W/m^2. That differs slightly from the actual mean Australian solar exposure anomaly of 2013. I know that because there are more towns listed in eastern and moist areas than in western and dry areas. As Western Australia had the third lowest, and below average, solar exposure anomaly, this has probably (and unusually) biased the result towards a higher anomaly value. More importantly, the eastern and moist areas are also the areas with the lowest albedo, so the bias probably also means the mean of the 61 towns better matches the actual mean effect of increased solar exposure than would a true mean of solar exposure. Whatever, the difference, however, we can be confident that the solar exposure anomaly lies between 0.03 and 0.09 W/m^2 (ie, +/- 2 SD of the 61 towns). It is important to note that this is a figure for solar exposure, not for the forcing anomaly. To obtain the later, we would need to multiply for, each region of Australia, the solar exposure anomaly by (1 minus the albedo) for that region. As I do not have the albedo data, I will content myself with the solar exposure data. 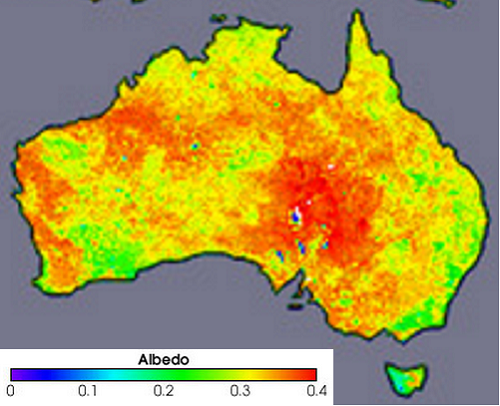 I will note, however, that Australia is mostly desert, and deserts have high albedos. The correction for an actual forcing anomaly is, therefore, likely to be substantial. Note, the orange bars are solar exposure in annual terms. The blue bars are the same figures averaged over the year in terms of W/m^2, and are the most directly comparable figures for the anthropogenic Effective Radiative Forcing. I think it is very clear from this that while the record solar exposure contributed to the warmth, and is a major factor in 2013 being a warm year relative to recent years - it is not as important a factor in the warmth of 2013 as is anthropogenic forcings. That is, 2013 was indeed warm relative to recent years due to high solar exposure. But recent years are warm relative to the early twentieth century due to anthropogenic global warming. Further, the attribution study got it right. It shows that a warm year relative to recent years allows us to show conclusively that recent warmth is not just an accident of natural variability. Tom, thanks for doing a more in-depth analysis. I wasn't sure how to convert Mj/sq M to W/sq M over a year. Tom, the increase in co2 concentrations between 2012 and 2013 are miniscule compared to the increase in solar radiatin. So far we have seen cold weather, storms, bushfires, decreasing Arctic Ice, increasing Antarctic sea ice, tornadoes, hurricanes and heat waves attributed to AGW. If 0.4 W/Sq M can cause the decline in Arctic ice, I am sure 2Mw/Sq M/day can push up Australian temperatures. Your argument that there have been hotter years with lower solar radiation whilst factual does nothing to prove your case. By your logic, temperatures should have increased every year since 1998 as the world has added billions of tons of Co2 since that time. bruiser, looking only at the CO2 increase from 2012 to 2013 deliberately ignores the vast majority of the warming caused by CO2. No one is claiming that the CO2 increase from that single year caused the recent high temperatures in Australia. That's a ridiculous straw man. Rather, the CO2 (and other greenhouse gas) increases over the past century plus have caused massive warming world-wide... without which the recent record high temperatures would not have occurred. Tom Curtis's graph comparing the solar forcing for last year against the total accumulated CO2 forcing would be better if it instead showed the change in solar forcing over the same time frame as the CO2 change, but that data isn't available. However, based on what we know about variations in solar forcing in general, the total change in solar forcing would still be much smaller than the CO2 forcing. If your claim that high solar irradiance last year was a primary cause of the observed high temperatures was valid then we should see similar changes in previous years of high and low solar irradiance... but barry has already demonstrated that this is not the case. Your hypothesis is contradicted by the evidence. CB, I believe 2.3W/sq M refers to the accumulated anthropogenic forcing since 1750. Bruiser, have you been skimming the replies to you? Your argument that there have been hotter years with lower solar radiation whilst factual does nothing to prove your case. By your logic, temperatures should have increased every year since 1998 as the world has added billions of tons of Co2 since that time. The idea is that there are many short term factors that influence annual temperatures. As a result temperatures may be warmer, or colder from year to year - but always within a limited range. ...Long term factors, such as increased atmospheric forcing from CO2, however, can shift the mean of that range, allowing temperatures that we would never have seen otherwise. Everyone is agreed here that annual temps will not monotonically respond to anthropogenic forcing. Solar exposure will have some impact, of course, even a major one in extreme years (high and low), but you are the only person trying to argue that this is the dominant factor, seemingly to advance the notion that last year's record-breaker was just a result of natural variability. But if 2013 solar exposure had an impact of 0.06 W/sq M above average, and accumulated anthropogenic forcing has had a long-term impact of 2.3 W/sq M, which is the greater contributor to the record temperature of the most recent year? Please note that I have reviewed my figures in construcing the graph @35 and detected an error, specifically I treated them as annual values when they should have been treated as annual averages of daily values. A apologize for that error. That means all of my post from the words "To try and resolve that question" is either false, or unsupported at the moment. I will try to extend my analysis to tackle the issue more accurately, but may take a day or so to do so. Once again, I apologize for the error. Would you lay out the conversion/time in some detail when you post? Barry @41, a Watt equals one Joule per Second. The units for the solar exposure are in Megajoules per day per meter squared. Therefore multiplying by one million then dividing by 86,400 (24 x 60 x 60) converts to Watts per meter squared. I originally thought the units were Megajoules per annum per meter squared, and further divided by 365. Correcting for that error, the maximum possible forcing from solar exposure is then 21.8 W/m^2. That is the figure before correction for albedo, and for loss of greenhouse forcing due to reduced cloud cover and water vapour content in the atmosphere. It is, however, sufficiently large that I cannot argue for a small relative effect without quantifying those values as I did in my prior post. The data is from Modis, and full global maps are available here. It is hard to derive an exact value, but as yellow, which predominates, represents an albedo just greater than 0.3, and as orange to red areas (3.5-4) are more extensive than green areas (0.2-2.5), I think an average albedo of 0.3 for Australia is a conservative estimate. That reduces the transient forcing from the high solar exposure (low cloud cover) over Australia in 2013 to approximately 0.7 x 22, or to 15.4. Further, the high solar exposure is due to low cloud cover, which reduces the greenhouse forcing due to clouds over Australia during that period. The solar exposure was 9.6% greater than normal. As the increased solar exposure was due to low cloud cover, that represents approximately a 9.6% reduction in cloud cover. Globally, single factor removal of clouds removes 14% of the total greenhouse effect, or 21.7 W/m^2. Therefore removal of 9.6% of clouds would remove 2.1 W/m^2 of the greenhouse effect. A similar reduction in WV content would remove just over twice that amount, but that does not allow for the overlap between WV and clouds. Single factor removal of Water Vapour and clouds at the same time removes 103.7 W/m^2 of forcing. Removing just 9.6% of that removes 10 W/m^2. Combined, these two effects will bring the net transient forcing from increased solar exposure in 2013 to about 5 W/m^2. Clearly the error margins on this calculation are large. Without exact information on cloud content, water vapour, temperatures and access to a climate model, I do not think I can significantly lower them. The final factor that comes into play is the lag in increase in temperature. It takes around 60 years for 66% of the final temperature response to a forcing to come into effect, and over 200 years for the full effect to be felt. Consequently a transient forcing over one year will not have the same temperature effect as a long term forcing that has been in existence for much of a century. The initial rise is rapid, however, especially over land. Therefore, while we would expect a transient forcing of 5 W/m^2 to not have had the same temperature response as a long term forcing of 5 W/m^2, it may have had the same, or greater response 2.3 W/m^2 (ie, the effective radiative forcing from anthropogenic activity). The consequence of this is frustrating. Bruiser will not be convinced, and nor should he be convinced, by this that he is wrong in attributing most of the increased temperature to the high solar exposure. The error margins are too large. Neither should he be convinced from this that he is correct, for the same reason. I have tried to be conservative in my calculation, and to the extent that I have succeeded, that means it is more likely that the errors will have favoured his case rather than undermined it, and therefore, that an error free calculation would show his case to be wanting. Therefore I do not believe we can use direct calculation of the transient forcing to further the discussion (contrary to what I attempted). This does not mean Bruiser should not be persuaded by the first part of my discussion (and by your comments). The fact is that the difference in temperature between years in the late twentieth and early twenty first century is much smaller than the difference in temperature between those years and years in the early twentieth century. That is not explicable in terms of solar exposure. It follows that while solar exposure is (very convincingly) the primary reason why 2013 was hot relative to 1990-2013, it is not the reason why 1990-2013 was hot relative to 1910-1939. Nevertheless, I would now like to analyze Australia's solar exposure data to determine if it has a trend; and what the relationship is between solar exposure and temperatures over recent years to strengthen (or refute) that case. Daytime cloudiness data at BoM website starts at 1957. Might be useful get a longer term estimate of solar exposure. Thanks for the update and fair comments. Openly admitting doubts and errors and self-correcting are rare enough virutes in these debates. How do you know that higher solar exposure is due to random fluxuations and is not a response to AGW forcing? Drought is predicted for Australia from AGW. Perhaps (most likely?) the high solar insulation in Australia is just a manifestation of AGW caused drought. Since we know all weather is affected by AGW, it seems to me that Bruiser must provide evidence to support his hypothesis that the higher solar exposure is random and not directly caused by AGW. I have not seen any data from Bruiser to support his hypothesis of random fluxuations. If the higher solar exposure persists in future years that would be evidence that it is caused by AGW (as a consequence of AGW caused drought) and not a random variation. Barry @43, thanks. I'll include that data in my analysis. Michael Sweet @44 that is an obvious possibility, but is not obvious. First, if it were the case, 2013 would not be so (apparently) statistically unusual with respect to other years from 1990-2013 (3 sigma in two stations tested - I'll report on Australia wide in a day or so). Second, the trend in cloudiness is towards more cloud, not less, at least since 1957. That is the reverse of what we would expect if this were a feedback. On theoretical grounds, the expectation is that when it is dry in warmed conditions, it will be dryer than it would have been under cooler conditions. That would translate into less cloud in warm dry conditions. Therefore there may be a feedback component in this, but it would be hard to argue for that from available data. Further, the feedback would also apply to naturally occuring warm dry conditions, suggesting Australia would have a higher probability of very warm years than standard deviations determined from normal years would suggest. Consequently, the idea that feedback is involved is refuted for a statistical trend; and equivacol if we consider its potential effect on exceptional years, whether those exceptional years are brought about by the combination of global warming plus natural variation, or natural variation alone. Climate change is projected to bring more water vapour but this is not uniform across the globe. Changes to the hydrological cycle vary by region. In Australia there has been increased precipitation in the North West, and decrease in the South West. Increasing drought is predicted for some regions but not for others. Rule of thumb is that wet regions will get wetter, and dry regions will get dryer. Tropical zones will see more rainfall and cloudiness, and the sub-tropics will become more arid. That's the general idea, though projections are not so spatially strict as this generalization, but the point is that climate change changes weather patterns n ways that are not uniform. Regional projections are less certain than global, so the comments here should be read with that in mind. How this might change cloudiness (and solar exposure) nationally is less clear. Increased water vapour should increase cloudiness. Rainfall is projected to become less frequent but more intense in some parts of Australia, and there are seasonal differences. AR4 projections on precipitation in Australia are here. that while solar exposure is (very convincingly) the primary reason why 2013 was hot relative to 1990-2013, it is not the reason why 1990-2013 was hot relative to 1910-1939. If you check bom sites that have temperature records that go back to the late 19th century, the hottest year is usually 1888 or early 20th century. One perticularly interesting location is the Cape Otway lighthouse where records go back to 1865. All the top 95 percentile are pre 1890. Yes, I'm still monitoring. You've changed the subject. The page you directed me to sorts mean minimum, mean maximum, and others highs and lows for monthly/annual, but not mean temperatures. First place I looked was my home town, Sydney, at Observatory Hill, where I know temp records extend back to the mid 19th century. I checked mean minimum annual data. The last few decades are definitely the hottest. Then I checked mean maximum annual. Same story. So I checked the town where I was born, but made it a rural site to avoid any UHI contamination - Mt Barker weather station, which is remote from urban build up. Mean min and mean max - Mean max temps have increased very slightly (0.2C from 23-year periods earliest and latest in the record), but the minimum temps have increased by 1C. Those were the first two I looked at. I fully expect to find some locations where temperatures are hotter in the late 19th century than present. This will be true for many individual locations around the world. 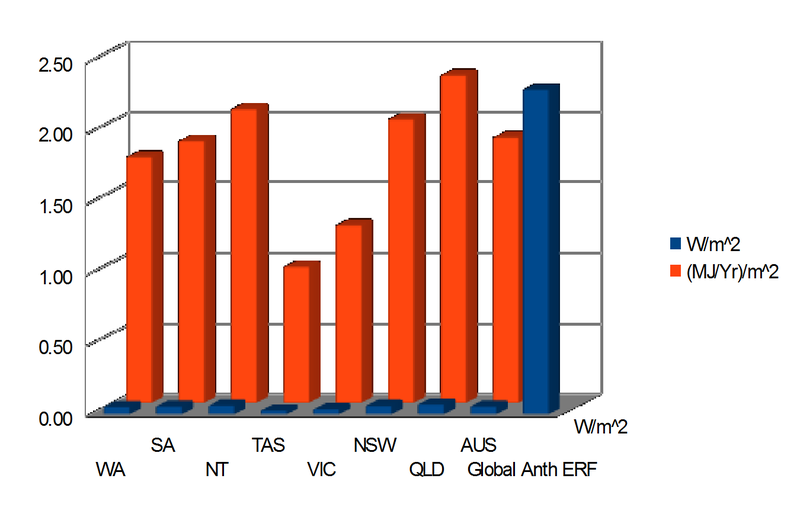 However, for the Australian record, data is too sparse back then to determine a national average. I would be curious about, though not convinced by, any attempts you know of that have simply averaged out the data available prior to the 20th century. While it wouldn't give much insight, it would be a step up from selecting a couple of stations. Why the change of topic? If you're still reading bruiser. I selected 40 station records at least 80 years long (couple of exceptions), with none starting after 1909. There were quite a few that didn't extend to the 2000s, and about half had data prior to 1900. Eyeballing the min/max graphs provided, 30 showed warmer temps in the last two decades of the period, 18 showed cooler, and 12 showed little change. Chose the records from here if you want to check for yourself. There are wild departures in the data pre-1910 (in both directions). They are surely suspect. @Barry, hi Barry, I did not change the topic so much as respond to your comment on your reference to "1990-2013, it is not the reason why 1990-2013 was hot relative to 1910-1939." Going back 80 years does not cut it and there has been some excellent work done on the urban heat island effect which can add up to 4 degrees to a city's temperature. The Sydney observatory is a great site for the length of recorded data but just as the Melbourne data is skewed due to location, Sydney suffers from the same problems. I should also correct my previous post - 1889 was the very hot year.